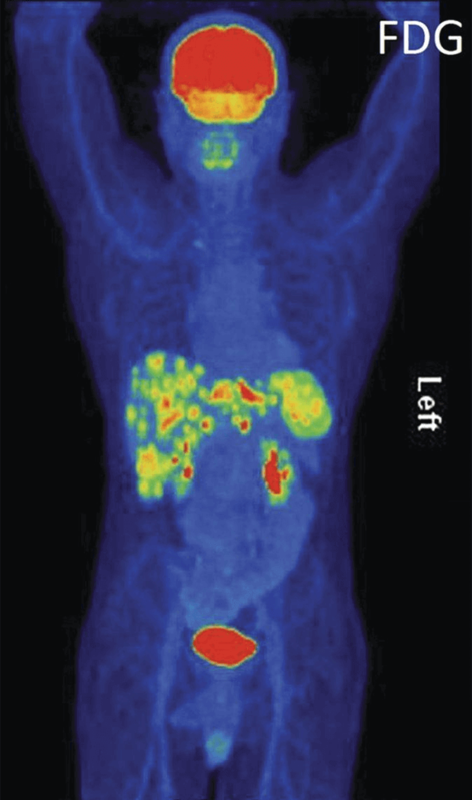 An FDG-PET scan of a patient with gastroesophageal junction cancer. Credit: Li M, Oxford Medical Case Reports Sept. 2014. doi: 10.1093/omcr/omu041. The Food and Drug Administration (FDA) has granted accelerated approval to the immunotherapy drug pembrolizumab (Keytruda®) for use in some patients with advanced gastric (stomach) cancer. The approval, announced on September 22, covers the use of pembrolizumab in patients with advanced gastric cancer or gastroesophageal junction cancer that has progressed despite two or more prior lines of treatment with standard therapies. The gastroesophageal junction is a narrow space where the esophagus meets the stomach. To receive the drug, patients’ tumors also must express the protein PD-L1. In conjunction with the pembrolizumab approval, FDA also cleared the Dako PD-L1 IHC 22C3 pharmDx assay to measure PD-L1 expression in patients with gastric cancer. As is often the case with accelerated approvals, FDA based its decision on promising results from an early- or mid-stage clinical trial. In this case, the approval was based on findings from a stage 2 clinical trial, called Keynote-059, in which all patients, regardless of PD-L1 status, received pembrolizumab. In the trial, which enrolled 259 patients with advanced gastric or gastroesophageal junction cancer, approximately 12% of patients experienced at least partial tumor shrinkage following treatment. However, patients in the trial whose tumors expressed PD-L1 (i.e., were PD-L1 positive) were more likely to respond. According to the most recent data from the trial, presented last month at the European Society for Medical Oncology (ESMO) annual meeting, 16% of PD-L1-positive patients achieved at least a partial response to the treatment, including several patients who had a complete disappearance of their tumors (complete response). The results confirm suggestions from earlier studies that pembrolizumab “is clearly active in patients with gastric cancer,” said the lead investigator of Keynote-059, Charles Fuchs, M.D., M.P.H., director of the Yale Cancer Center. Patients with advanced gastric cancer have few effective treatment options, particularly those whose cancer has stopped responding to existing therapies. The targeted therapy trastuzumab (Herceptin®) is approved as an initial, or first-line, treatment for patients with advanced gastric cancer that overexpresses the HER2 protein. The only FDA-approved therapy for patients whose disease has stopped responding to initial treatment is ramucirumab (Cyramza®), which was shown to modestly improve how long patients lived in two large clinical trials. Little progress has been made in finding new, more-effective therapies for stomach cancer, said Dr. Fuchs, because so few drugs have been designed to address its specific biology. With the exception of ramucirumab, “there’s never been a drug that was explicitly developed and approved for stomach cancer,” he explained. But a door opened with the findings from the first studies from The Cancer Genome Atlas. Those studies revealed that tumors in a substantial portion of patients with gastric cancer express PD-L1, Dr. Fuchs explained. PD-L1 is a protein on tumor cells and other cells in the tumor microenvironment that binds to PD-1 on immune cells, an action that serves to tamp down the immune response against tumors. That finding, Dr. Fuchs said, created an opportunity for researchers to test whether agents that target PD-L1 or, like pembrolizumab, its binding partner on immune cells, PD-1, may provide a new option for gastric cancer. In the KEYNOTE-059 trial, which was funded by pembrolizumab’s manufacturer, Merck, 148 patients had tumors that expressed PD-L1. Many of the partial and complete responses seen in these patients persisted for long periods, ranging from just a few months to more than a year. “The responses really are quite robust and far longer than you would see with any cytotoxic chemotherapy agent,” Dr. Fuchs said. In addition, three patients whose tumors were PD-L1-negative—according to the parameters used for the trial and the approved test kit—also had complete responses. In general, patients in the trial tolerated pembrolizumab well, Dr. Fuchs said, with most experiencing only mild side effects. Common side effects included fatigue, anemia, and dehydration. Seven patients, however, had to stop treatment because of severe side effects, and two patients died from treatment-related side effects. Drugs that target PD-L1 “will clearly have a role in advanced gastric cancer,” Eric Van Cutsem, M.D., Ph.D., head of the Division of Clinical Digestive Oncology at the University Hospitals Gasthuisberg in Belgium, said after the Keynote-059 results were presented at the ESMO meeting. But he cautioned that further research is needed to understand how these agents can be used most effectively in patients with stomach cancer. “The role of PD-L1 expression [as a predictive biomarker] has to be clarified,” Dr. Van Cutsem said, adding that other predictive markers also need to be identified. A close analysis of the Keynote-059 trial data does provide some additional guidance on which patients are more likely to respond to pembrolizumab, Dr. Fuchs explained. Patients who were PD-L1 positive and who had undergone only two prior lines of treatment were more likely to respond than patients receiving the drug as a fourth- or fifth-line treatment. “So, you see a clearly diminishing response rate” in patients who have received more prior lines of treatment, he said.